Chana wants to see the funny add of pinky finger which had sparked outrage in Australia. It is a very much debated advertisement brought by australian government. It is not so attractive but it is found that 3/4 of the people think this advertisement is working. Remember, 50 to 60 percent crashes are due to speeding. 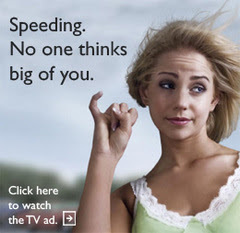 This cool add not only produces outrage but also decreases fatality due to speeding and brings peace in the society. This is a video related to this pinky finger for TV advertisement.